splendid isolation: Well here's a thing. I suppose it's two things really. 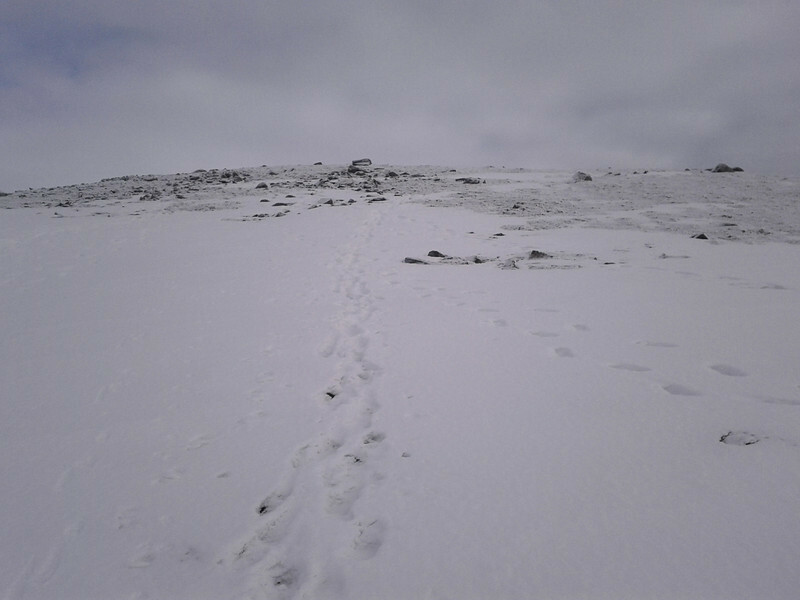 First, a blog post, and second a post about actually walking up a hill. A post - and a hill - that encompasses two days out, as it happens. 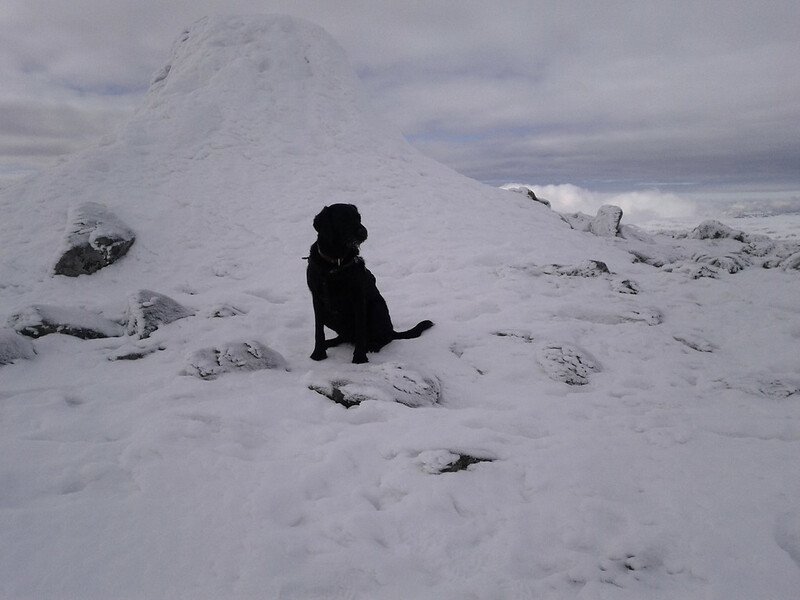 A week past on Sunday me, Andy, Colin and Jim (and the WBD) had ventured Monath Liathwards for a go at Geal Charn. 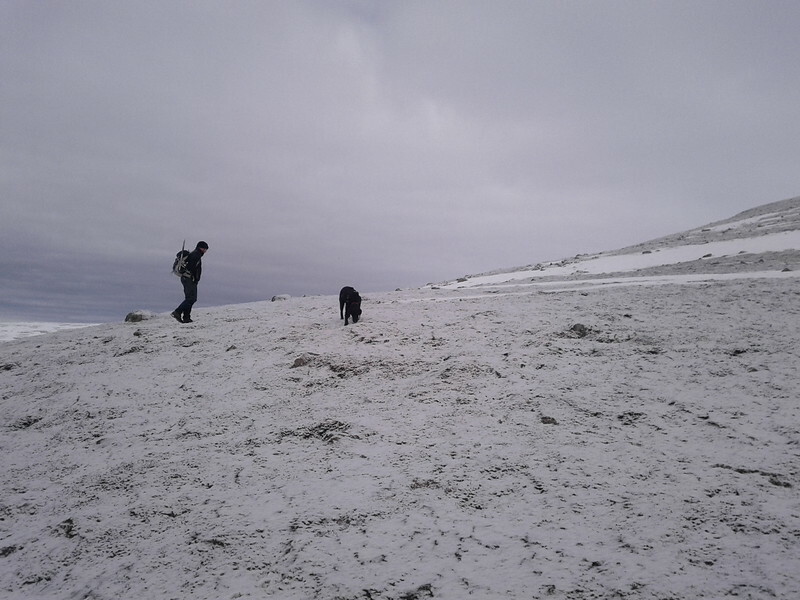 If you were out on the hills on the 10th of February yourself, you'll probably remember the weather. Suffice it to say that the wind speed was significantly greater than the 30 or 40mph that MWIS had predicted, with the result that despite a sterling effort on the part of all concerned, we got to within a few hundred yards of the summit and collectively decided that it was too windy, too cold and too difficult to see a foot in front of one's face to continue. 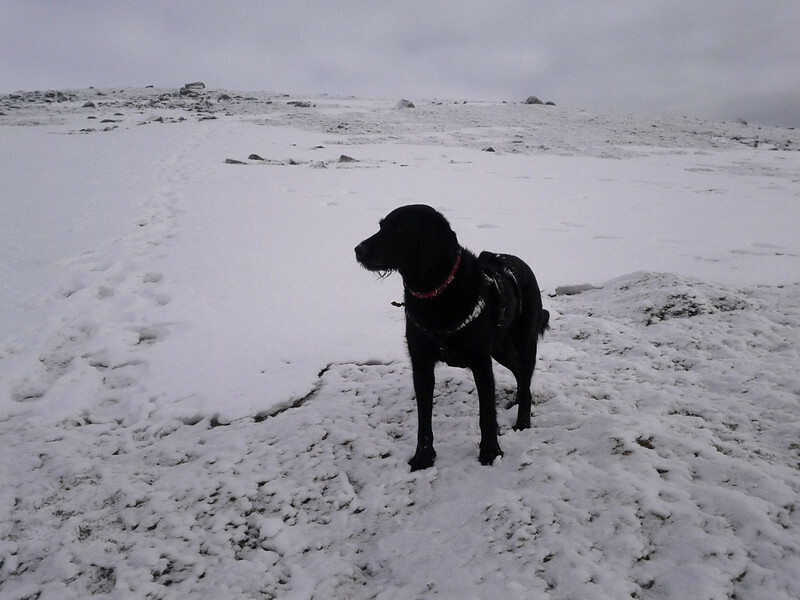 Even the dug was getting morose, and she likes a walk. So, wise counsel prevailed and the hill was saved for another day. Today, as it transpired. The main reason was that the hill forecast was claiming that there would be "negligible" wind, so we figured that'd mean 40 miles an hour tops, and it was worth another punt. We had been ungenerous to MWIS. They were bang on. 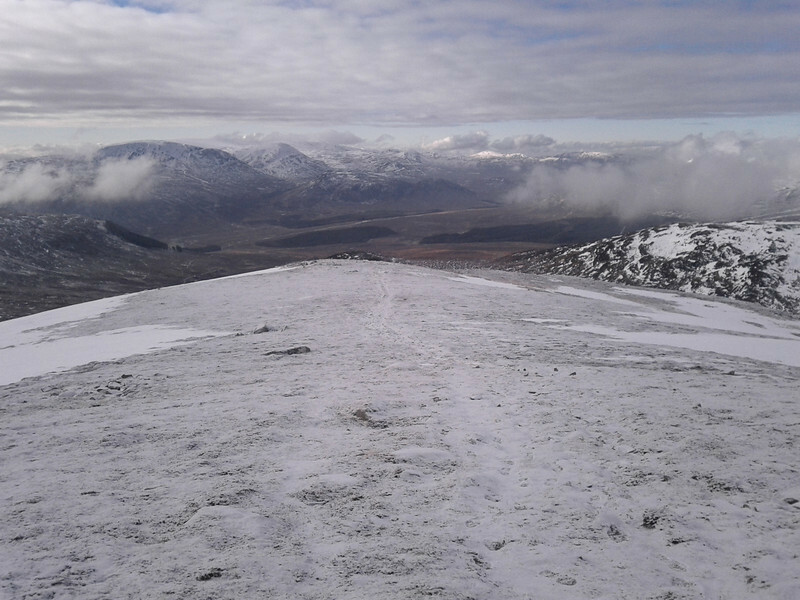 It was cold higher up, certainly but there couldn't have been more of a contrast with the last attempt. 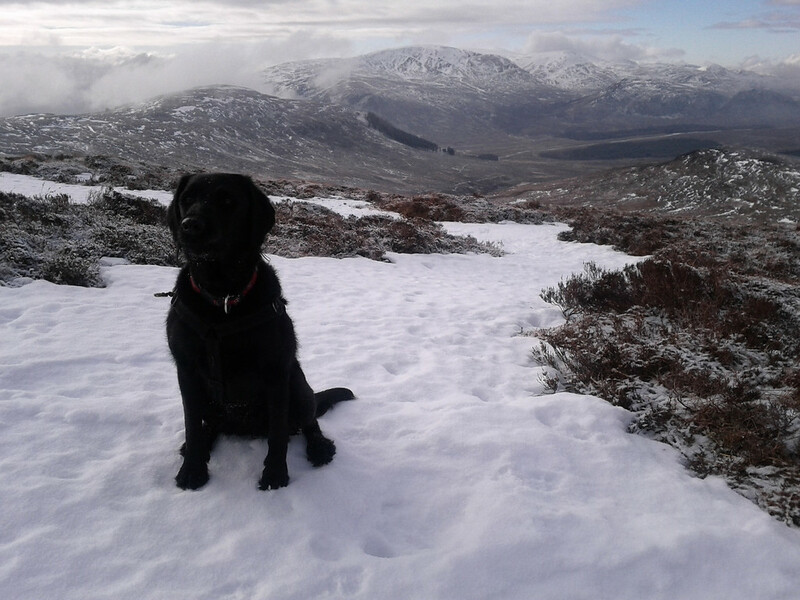 Nae wind, much less snow and - crucially - what snow there was didn't crumble underfoot and make progress a trial. 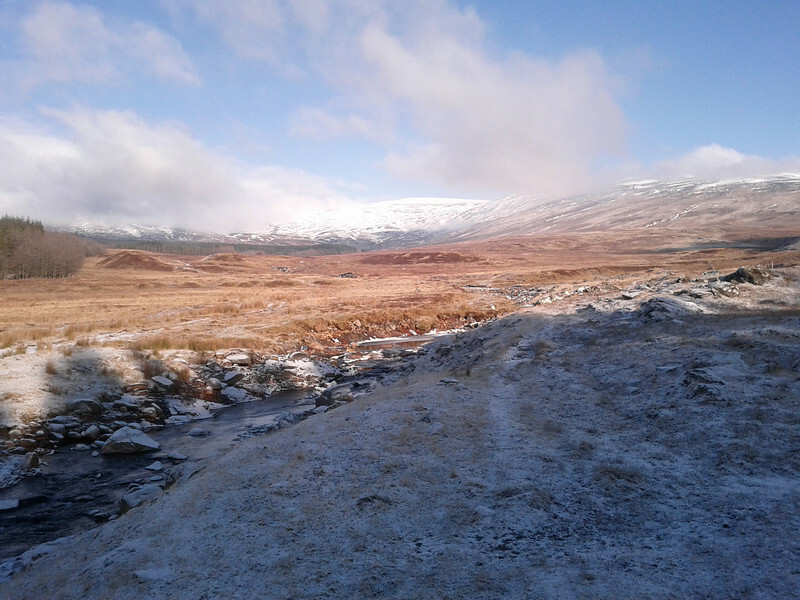 As an added bonus, the first hour from the car park at Garva Bridge (which had been horrifyingly boggy last time) was a firm grass-frosted cakewalk. 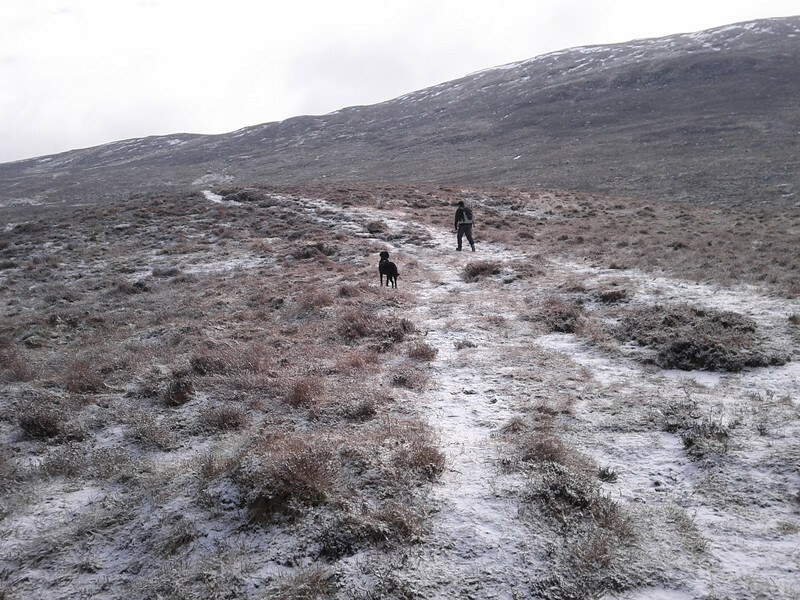 We followed the traditional route, lifted here from Walkhighlands. 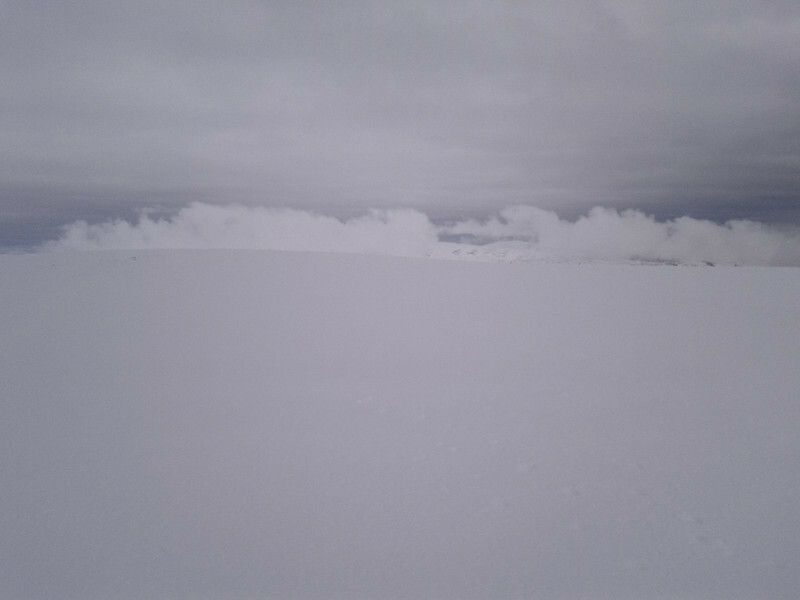 As a point of mild interest it took us six and a bit hours the last time to get to somewhere near the summit and slide back down, fighting the gale. It took us four and a half hours today to get to the summit, have a leisurely lunch stop, and then enjoy the return dauner to the car.
" 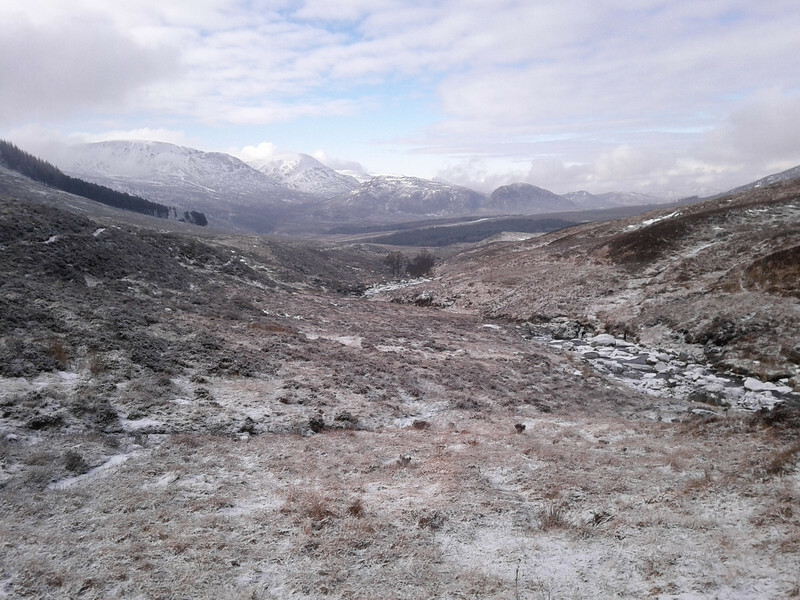 Start from the parking area on the left just before Garva Bridge, some distance up the minor road past the Spey dam. 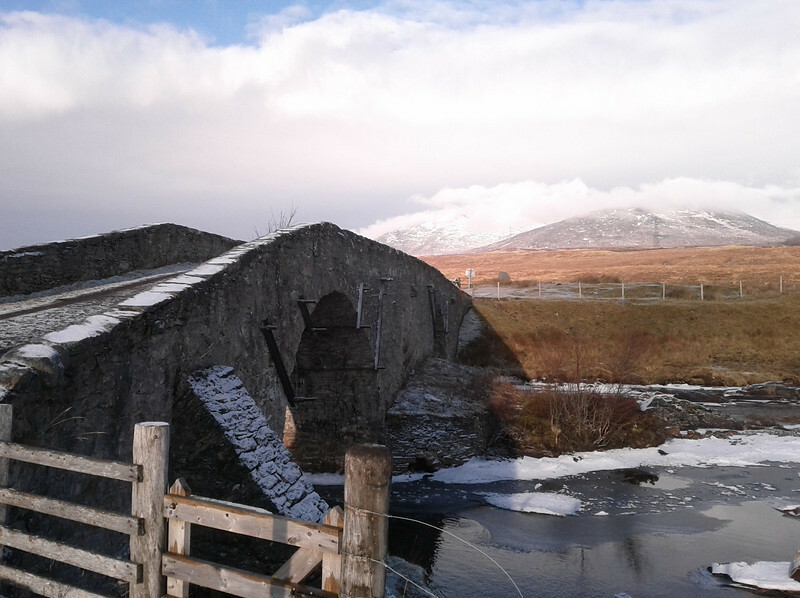 The double-span stone bridge was built by General Wade as part of his route over the Corryairack Pass. 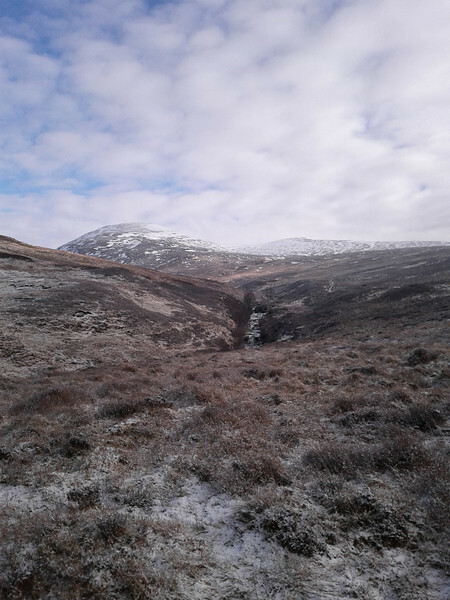 This is a lonely piece of countryside, with vast herds of red deer; apart from the Munro-baggers heading for this summit there are few visitors. Cross the bridge and then take the next right turn up a track which leads off north from the road. 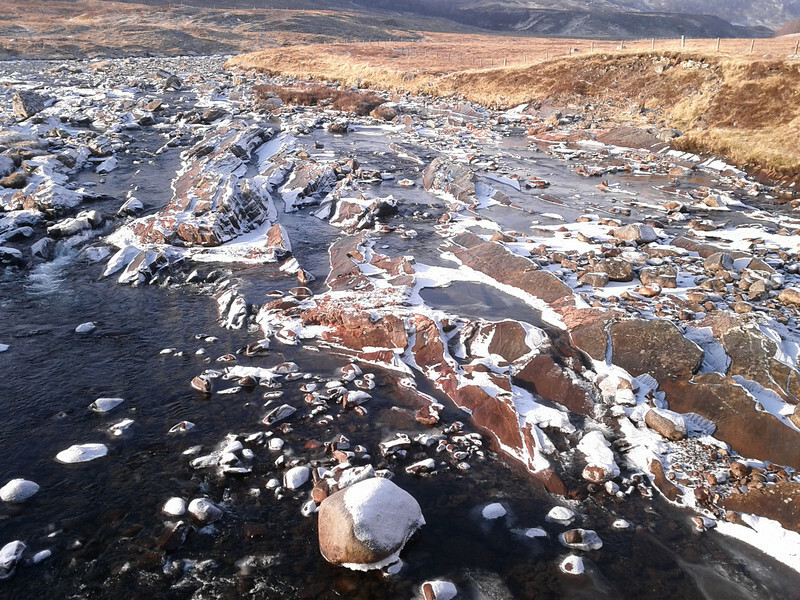 It reaches a new track used in the construction of the Beauly-Denny pylon line; turn right on this, crossing a bridge over the Allt Coire Iain Oig, and then left onto a track on the far side. Almost immediately cross the wire fence on the left - either stepping over or under - and then follow the grassy banks of the river upstream." "There is only a faint path at first but it soon becomes clearer. Continue beside the Feith Talagain until after passing through a gap in a fence. 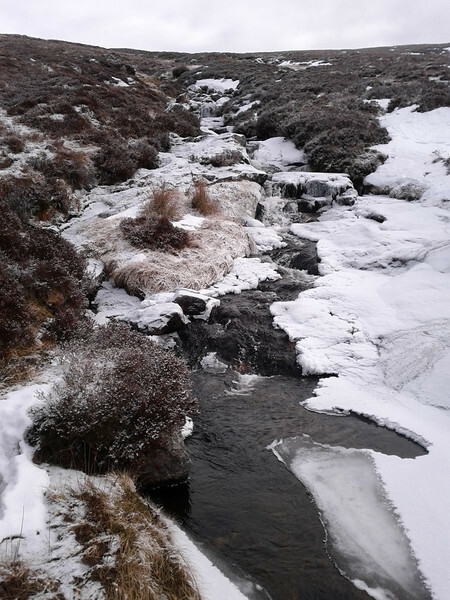 After this the path keeps higher above the burn, crossing boggy moorland." 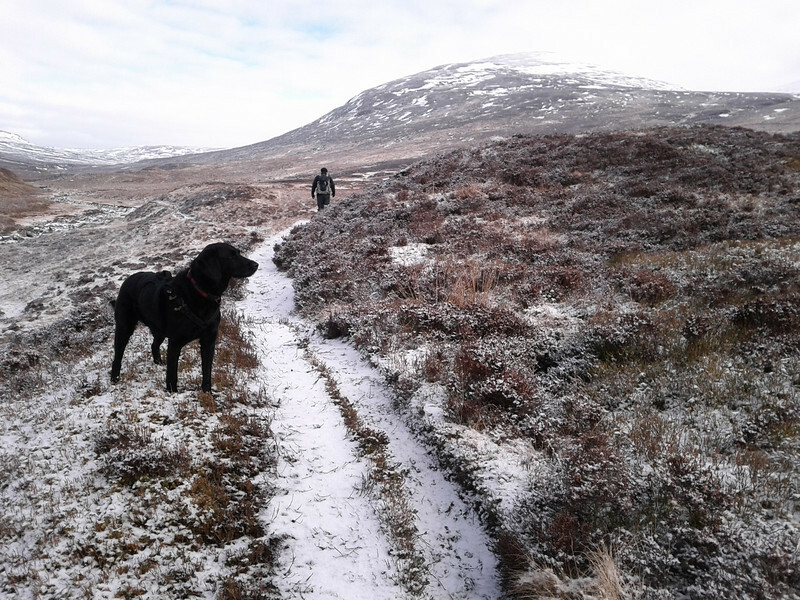 ...either way, the route leads up to the top of a flattish shoulder southwest of Geal Charn, by which point there are fine views looking back towards the hidden side of the Creag Meagaidh group across the glen, and glimpses towards the Loch Laggan Munros." ...until the flatter plateau is reached. 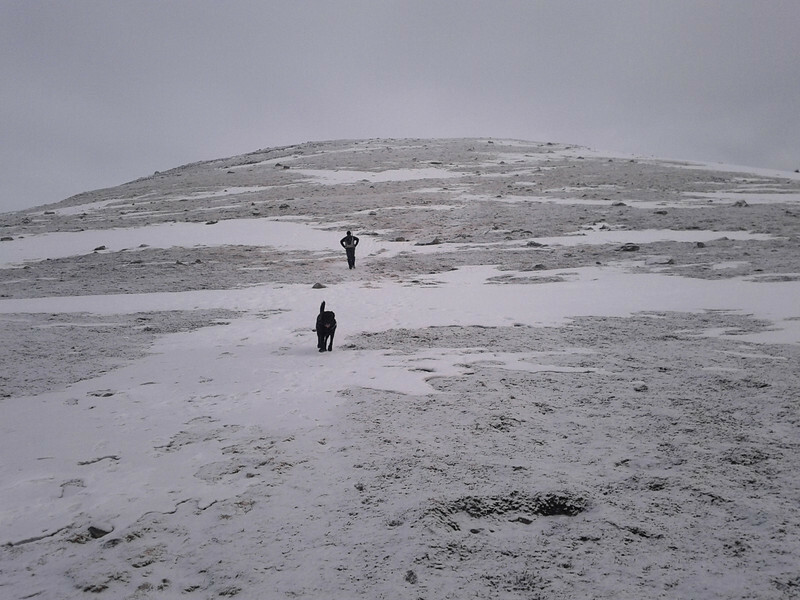 The massive cairn marking the summit is around 700m further across the plateau. 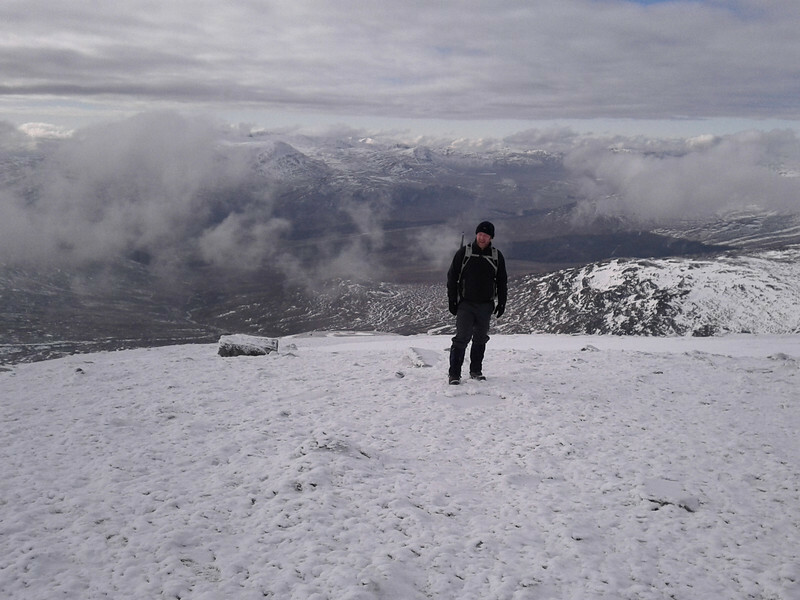 At 926 metres this is the fourth of the Monadhliath Munros; there is a vast, featureless wilderness extending to the north." All things considered, that description rather checks out. I can't stress enough, mind you, how the truth of the matter is that you should only do this hill (a) when it's been cold enough to give right hard ground frost, but not cold enough that the surprisingly steep slopes become an impromptu bobsled run; (b) when it's not windy enough to blow you off your feet even if you're a short-arsed fat guy with a formidably low centre of gravity, and (c) when it's clear enough to get the views over towards Beinn a' Clachair et al at Laggan, and across to the back of Creag Meagaidh, and over to the Drumochter hills and the Ben Alder range, largely so you can understand that for a hill that gets such a bad press in the Munro guides, it really can be rather a braw day oot. I might yet persevere with this whole hillwalking thing.